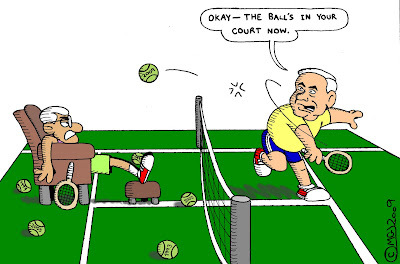 The ball's been in the Palestinian court many times... and Israel keeps serving 'em up. For the uninitiated: 1991 - Madrid Conference; 1993 - Oslo Accords; 2000 - Camp David II; 2005 - Gaza Disengagement. UPDATE: Better late than never, I suppose: three years and twenty-six days after its initial publication, now my ninth cartoon on La Boucle d'Occam.